In Buddhism, the three marks of existence are three characteristics (Pali: tilakkhaṇa; Sanskrit: trilakṣaṇa) of all existence and beings, namely impermanence (anicca), unsatisfactoriness or suffering (dukkha), and non-self (anattā). These three characteristics are mentioned in verses 277, 278 and 279 of the Dhammapada. Anicca (Sanskrit anitya) means "inconstancy" or "impermanence". All conditioned things (saṅkhāra) are in a constant state of flux. All physical and mental events, states Buddhism, come into being and dissolve. Human life embodies this flux in the aging process, the cycle of repeated birth and death (Samsara), nothing lasts, and everything decays. This is applicable to all beings and their environs, including beings who have reincarnated in deva (god) and naraka (hell) realms. This is in contrast to nirvana, the reality that is Nicca, or knows no change, decay or death. Dukkha (Sanskrit duhkha) means "unsatisfactoriness, suffering, pain". The dukkha includes the physical and mental sufferings that follows each rebirth, aging, illness, dying; dissatisfaction from getting what a being wishes to avoid or not getting the desired, or because all forms of life are impermanent and without any essence. Anatta (Sanskrit anatman) refers to the doctrine of "non-self", that there is no unchanging, permanent Self or soul in living beings and no abiding essence in anything or phenomena. While anicca and dukkha apply to "all conditioned phenomena" (saṅkhārā), anattā has a wider scope because it applies to all dhammā without "conditioned, unconditioned" qualification. Thus, nirvana too is a state of "without Self" or anatta. 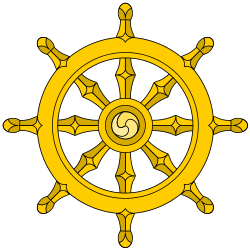 The phrase "sabbe dhamma anatta" includes within its scope each skandha (aggregate, heap) that compose any being, and the belief "I am" is a mark of conceit which must be destroyed to end all Dukkha. The Anattā doctrine of Buddhism denies that there is anything called a 'Self' in any person or anything else, and that a belief in 'Self' is a source of Dukkha. Insight into the three marks of existence can bring an end to suffering (dukkha nirodha or nirodha sacca, the third of the Four Noble Truths). The Buddha taught that all beings conditioned by causes (saṅkhāra) are impermanent (anicca) and suffering (dukkha), and that not-self (anattā) characterises all dhammas, meaning there is no "I" "me" or "mine" in either the conditioned or the unconditioned (i.e. nibbāna). The teaching of three marks of existence in the Pali Canon is credited to the Buddha. ↑ Steven Collins (1998). Nirvana and Other Buddhist Felicities. Cambridge University Press. p. 140. ISBN 978-0-521-57054-1. ↑ Robert E. Buswell Jr.; Donald S. Lopez Jr. (2013). The Princeton Dictionary of Buddhism. Princeton University Press. pp. 42–43, 47, 581. ISBN 978-1-4008-4805-8. ↑ Carl Olson (2005). The Different Paths of Buddhism: A Narrative-Historical Introduction. Rutgers University Press. pp. 63–64. ISBN 978-0-8135-3778-8. ↑ Walsh 1995, p. 30. ↑ Thomas William Rhys Davids; William Stede (1921). Pali-English Dictionary. Motilal Banarsidass. pp. 355, Article on Nicca. ISBN 978-81-208-1144-7. ↑ Malcolm Huxter (2016). Healing the Heart and Mind with Mindfulness: Ancient Path, Present Moment. Routledge. pp. 1–10, Introduction. ISBN 978-1-317-50540-2. ↑ Bhikkhu Bodhi (2005). In the Buddha's Words: An Anthology of Discourses from the Pali Canon. Simon and Schuster. pp. 67–68. ISBN 978-0-86171-491-9. 1 2 3 Richard Francis Gombrich; Cristina Anna Scherrer-Schaub (2008). Buddhist Studies. Motilal Banarsidass. pp. 209, for context see pp. 195–223. ISBN 978-81-208-3248-0. ↑ Joaquín Pérez Remón (1980). Self and Non-self in Early Buddhism. Walter de Gruyter. pp. 218–222, 234. ISBN 978-90-279-7987-2. ↑ Joaquín Pérez Remón (1980). Self and Non-self in Early Buddhism. Walter de Gruyter. pp. 210–225. ISBN 978-90-279-7987-2.